Meet Joseph Paulraj, a pioneer of MIMO wireless communications, a technology breakthrough that has revolutionised high speed wireless delivery of multimedia services for billions of people across the globe. “Though I initiated this concept, there are thousands of engineers and researchers all over the world who have made research advances and developed products that we all use. I was just a small spark that lit a pretty big fire,” says Joseph Paulraj on his achievement. It has been an incredible journey for Arogyaswami Joseph Paulraj, Professor (Emeritus), Stanford University, California who started his career in the Indian Navy. Winner of the prestigious $100,000 Marconi Prize for 2014, considered the Nobel Prize of Information Technology, Joseph Paulraj has done India proud with this award. The Marconi Society, founded 50 years ago by Gioia Marconi Braga, annually recognises one or more scientists who -- like her father, radio inventor Guglielmo Marconi -- pursue advances in communications and IT for the social, economic and cultural development of all humanity. Dr Paulraj is known as the father of MIMO (Multiple Input, Multiple Output) -- the idea of using multiple antennas at both the transmitting and receiving stations that is at the heart of high-speed WiFi and 4G mobile systems -- and has revolutionised high speed wireless delivery of multimedia services for billions of people across the globe. The big value of MIMO is that it multiplies radio spectrum, a precious and a limited resource. 'Every WiFi router and 4G phone today uses the MIMO technology pioneered by him,' Professor Sir David Payne, chairman, Marconi Society, and director, Optoelectronics Research Centre, University of Southampton, said in a press statement. Paulraj joins the elite group of IT pioneers like Tim Berners-Lee, inventor of the World Wide Web; Vint Cerf, considered one of the fathers of the Internet; Larry Page, co-founder, Google; and Marty Hellman, inventor of Public Key Cryptography. But to get the small spark required to light a big fire, he had to deal with a lot of push back and skepticism before getting his technology to the point where now there are about 14,000 research papers surrounding it of which he and students have written only about 300. “It has been a lot of work, but it has all been worthwhile because MIMO is a very important technology,” he said. Paulraj not only invented and developed MIMO, he also gave India a world-class sonar technology. Advanced Panoramic Sonar Hull mounted (APSOH), which his team developed, remains one of India’s truly world-class achievements in electronics. The ship-borne sonar system, which performs active ranging, passive listening, auto tracking of targets and classification, is used by the Indian Navy, where Paulraj began his career. Paulraj said he always worked on research and development assignments during his 25-year Navy stint. As part of the electrical engineering branch, his training focused on practical skills for maintaining weapons systems, but he wanted more and taught himself subjects like control theory, information theory and signal processing, said the Marconi Society. Impressed, the Navy sent him to the Indian Institute of Technology-Delhi, for an MS programme in 1969. 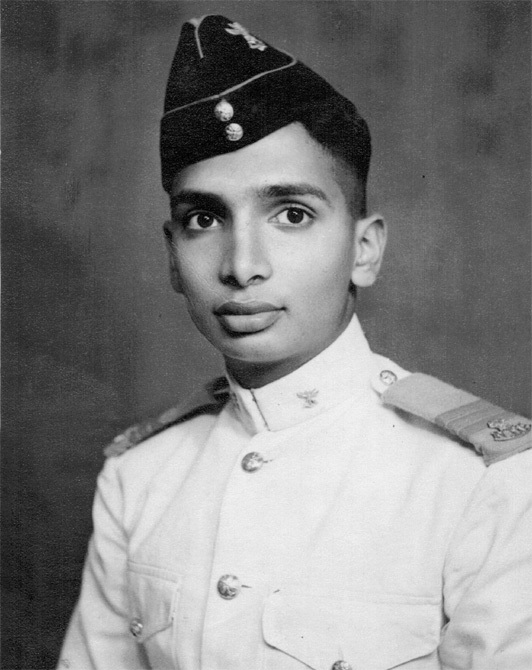 Image: Professor Paulraj during his Navy days. Paulraj performed so well at IIT that he caught the eye of an influential professor of electrical engineering who convinced the Navy to allow Paulraj to switch to the PhD programme. Paulraj had just two years to wrap up his research for the doctoral programme, but that opportunity changed his life. It was there that he met Thomas Kailath, the man whose book, Linear Systems, is considered one of the most referenced books on the subject. The Pune-born Hitachi America Professor of Engineering, Emeritus, Stanford University, visited IIT-Delhi to deliver a few lectures. Inspired by those lectures, Paulraj went on to make fundamental advances in non-linear estimation theory using tools from Ito calculus and stochastic diffusion theory. He earned his PhD for his work on non-linear estimation theory. He returned to the Navy where he was eventually asked to lead the sonar development project that resulted in APSOH. As a reward for his work on this, Paulraj was given a two-year sabbatical to explore new areas, and he earned a visiting scientist slot in a group working with Kailath, despite, he said, some initial scepticism from the latter. At Stanford, Dr Paulraj worked on a multiple signals directions of arrival estimation problem that had a long history of advancements using a spectrum approach. He discovered a new method called ESPRIT (Estimation of Signal Parameters via Rotational Invariance Techniques). After two years, in 1986, Dr Paulraj returned to India where the Navy assigned him to serve as founding director for three major labs -- Center for Artificial Intelligence and Robotics; Center for Development of Advanced Computing, Bengaluru Center; and Central Research Labs of Bharat Electronics. But by 1991, the bureaucratic difficulties of operating in government labs had begun to take their toll on Paulraj. With the Navy’s consent, he took early retirement and returned to Stanford. 'At Stanford, while awaiting a faculty appointment, Paulraj worked on signal separation experiments for airborne reconnaissance,' the Marconi Society said in its announcement. He remembers the scepticism Paulraj faced about MIMO’s practical feasibility, and his belief in the technology. Paulraj took leave from Stanford in 1998 to found Gigabit Wireless, now known as Iospan Wireless Inc, and built a MIMO-based commercial system. He used his savings to build the MIMO radio, which finally made venture capital firms take notice. Within three years he had proven MIMO’s worth in typical cellular applications and in another two years Intel Corp had acquired Iospan’s technology. With Intel, Dr Paulraj worked on the development of WiMAX mobile standards. 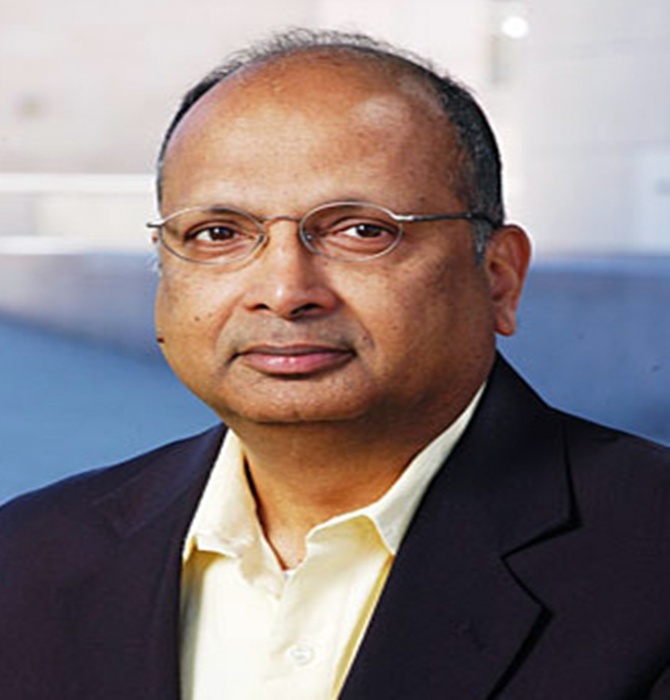 He continued this work with the co-founding of Beceem Communications, which became a world leader in WIMAX semiconductors before being acquired by Broadcom Corp.
Paulraj, who today straddles an academic and industry role, lives on the Stanford campus with his wife, but remains a frequent visitor to India. And when he goes back he sees the burning need for the country to build its own telecommunications technology industry. He said he hoped to find more ways to contribute personally to that goal. 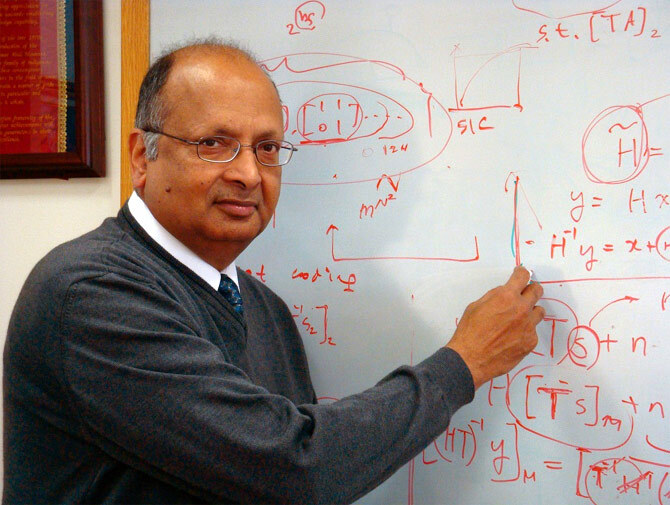 Dr Paulraj, who received the IEEE Alexandre Graham Bell Medal in 2011, will receive the Marconi Prize at a ceremony in Washington, DC in fall, becoming the only India-born scientist to receive the two top global IT awards. The Marconi Prize will include a $100,000 prize that he plans to gift back to the Marconi Society. 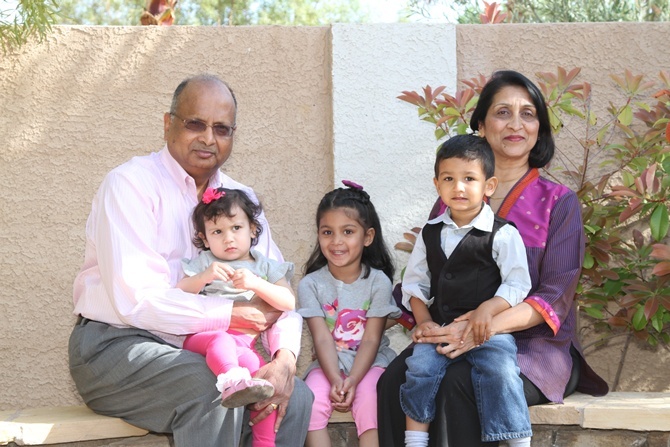 Image: Prof Paulraj with his family.